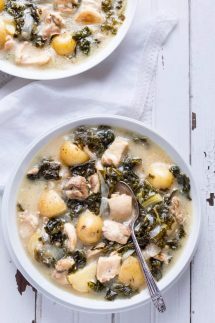 Healthy Paleo Chicken Stew with Kale and Dijon Mustard, So simple to make and with ingredients you can find anywhere! it’s also Whole30 and gluten free. 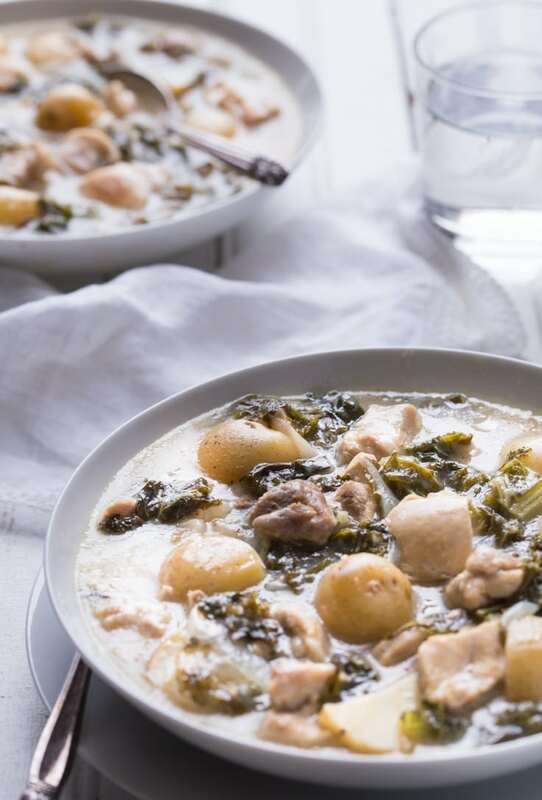 It’s hard to believe that just a handful of simple ingredients could make a Healthy whole30 Chicken Stew, it’s so simple to make and with ingredients you can find anywhere. it’s also Whole30 and gluten free. and Potatoes, but it’s true! I came across this recipe in an old Cooking Light annual recipes book and have adapted it to turn it into a simple weeknight dinner. most of it, I guess I can’t win them all! 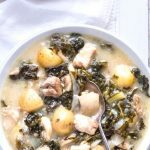 Despite my son’s lack of enthusiasm for kale, I still think that this is a fabulous paleo chicken stew and makes a perfect supper for this lovely cool fall weather we’re finally enjoying. I’m all about cooking dinners that are simple to prepare, quick to cook, and taste really great so this meal fits the bill nicely. I like to use the small new potatoes as it’s just easier to cut them in half without peeling them, I like convenience and making things easy! However they can be pricey sometimes so if that’s the case then I would use a regular yellow or red potato and then peel it and cut it into large chunks, you don’t want the pieces so small that they turn to mush in the stew. I have included directions for you to cook it in your slow cooker if you prefer to cook it that way. The original recipe used leeks and not onions, but they’re not always available in my grocery store so I opted for regular white onions and they worked really well. If you prefer to use leeks be sure to wash them well one you cut them up so you get all the dirt out from in between the leaves. 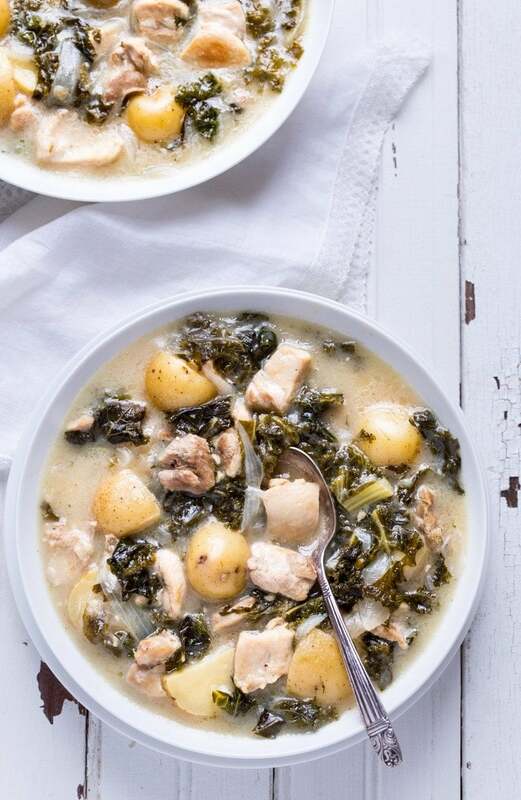 A really simple rustic style Chicken Stew with Kale and Potatoes. Easy to prepare and quick to cook, perfect comfort food! Recipe adapted from an old Cooking Light Annual Recipes book. Choose a large heavy bottomed pan for your stew and heat 1 tbsp oil in it. Add the onions to the pan and saute on a medium heat until they soften, it takes about 5 minutes, in the last minute add the crushed garlic cloves. Remove the onions to a plate once they are done. Place the cornstarch into a bowl and season with 1/4 tsp each of salt and pepper, add the chopped chicken pieces, mix the chicken in with the cornstarch so that it is well coated. Add the remaining oil to the pan and heat to medium high, then cook the chicken until browned, about five minutes or so. You may need to do this in batches so as not to crowd out the pan or you will end up steaming the chicken. Return the onions to the pan along with the chicken broth, dijon mustard and water. Using a wooden spoon make sure you scrape up all the browned bits of chicken from the base of the pan and into the broth. Now add the potatoes and cover and simmer for about 30 minutes. Add in the kale and mix it in to the stew, it might seem like a lot but it will cook down pretty quickly. Cover the pan and cook for a further 10 minutes. Taste and adjust seasoning if needed, serve hot. Follow the directions for browning the chicken as above, now add the chicken to your slow cooker and all remaining ingredients except the kale. Cook it on low for 5 - 6 hours, or high for about 3 - 4. how long it takes will depend on the heat of your slow cooker. Add the kale in the last hour of cooking and cook until it's soft and wilted. I have two slow cookers and the newer one is hotter on the high and low settings than the older one. Bold flavours and perfect pairings; this stew looks delicious! I like how it is something different from traditional, and Dijon chicken sounds like the perfect addition to a soup/stew! That looks like the perfect fall soup! I love the dijon and the kale! The perfect comfort food. I love soup season and this stew look fantastic. Love the combo of ingredients here! This is pure comfort food! I love everything about this soup! What a scrumptiously healthy dinner. I wish I hadn’t just used my kale in another recipe. I think I need to go get more! Kale fan here. I am convinced! This sounds amazingly simple and delicious. My family aren’t big dark meat fans though. Would it be possible to make this with chicken breast and not have it dry out? Made this for dinner tonight. I really liked the dijon mustard broth. It was simple yet tasted sophisticated. I can’t eat tomatoes so it was nice to find a tomato-free stew recipe. i just boiled the chicken instead of pan frying to save time and used a hand blender to blend up sauted onions and broth since my son doesn’t like onions (but is okay with it blended into soup). It was delicious! Ooooh this sounds REALLY good! I’m a sucker for anything dijon, and anything that cooks kale down! Thanks Trish! This was surprisingly good for such a simple stew!